Decorating and furnishing an empty room in the house is usually one of the hardest tasks that any of us can come across. It requires innovation, creativity, sense of beauty and above all, availability and resources. You are simply drawing a paint that has non-customizable walls, ceiling, and floor. Yet, that paint will be your living place for a lifetime. How good and beautiful should it be? You cannot accept less than stunning in that matter. The same concept applies to that newly empty room in your house. Yes. You are missing out every minute passing by without revamping and using those inches around the house. Throughout our previous long experience in the designing business, we came across so many houses that we successfully revamped from the entrance to the basement as well as the attic, or just re-designed one or two rooms only. Usually, there is a story behind each newly empty room and, most commonly, it is all about a teenage leaving the parent’s house for college. Henceforth, we are here to help you get the best use out of your son’s/daughter’s old room. The first thing you need to decide, as soon as your eyes fall on that empty room down the hall is whether your newly empty room needs a total revamping and furnishing or just a little reshaping here and there. Now the difference between a complete makeover and a little touch up is huge. Simply, a complete makeover steps in if you were eager to empty a small space around the house in order to squeeze in a small, chic office for yourself. Meanwhile, if you still want to keep the room ready for your son/daughter to use on their visits and feel that nothing has changed, yet use it all year long, you are looking for a touch up. The revamping ideas are enormous. In fact, your dilemma might not be in finding the right design for your new room. It all revolves around finding the best option that suits your needs and serves your tasks. For instance, you might need to turn that bedroom into a gymnastics area that holds all your gym equipments and tools. Imagine that you can schedule a specific time for your exercises and daily routine away from the sun, hot weather and all along with your TV and sound system. What is more, your new space can become that relaxing massage room that has a soft, silky massage special bed you’ve always dreamt to have. Together with a cabinet that can hold all the necessary messaging and comforting oils. Not to mention a small table a granite top to sort all kinds of nourishing and soothing body and facial creams. Undoubtedly, this can be your own special resort where you spend most of your day in with your spouse, just chilling. Moreover, it does not all have to revolve around only what you might use around the house. Why not involve your hobbies, activities, and interests in your own house. Thus, giving yourself the chance to spend more time at home. In addition to being able to customize and change anything you need the second you need it! For instance, you can give yourself a treat in a specially designed space for your yoga sessions. Just imagine and live in not only a meditating activity but also a relaxing atmosphere. I am not only talking about the vacant area, or the yoga mat. 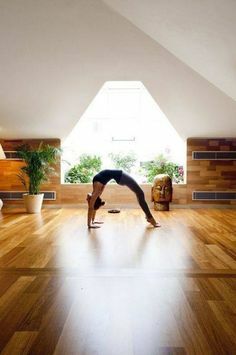 I am talking about a room designed for your yoga exercises from A-Z. Starting with the calming and relieving paint on the walls and ceiling, windows looking on green area and all the way to special soft lighting. The ideas are endless when it comes to using a space the way you need it. Simply, because each one of us has a priority, a need and a desire. Some people, actually, wait for such a chance to revamp that empty kid’s room to a huge dressing room for their own. Enormous closets that fit both your winter and summer clothes, together with an exclusive cabinet for shoes. Not to mention giant mirrors all around the place with a definite use for each. Indeed, a space is always a grace. Share more ideas with us on revamping that free space in your house and let us be part of your experience. This entry was posted in DIY, Home Improvement by admin. Bookmark the permalink.